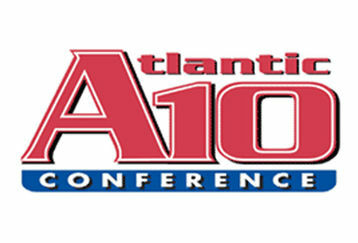 Joseph Dzuback of Villanova By The Numbers is the RTC correspondent for the Atlantic-10 Conference. Efficiency Differentials Sort Out the Best and Worst: In an effort to assess the “quality” of each team’s conference record, I included an SOS table below, consistent with Ken Pomeroy’s formula, on the average of the adjusted offensive and defensive efficiencies for the conference teams played so far. The four teams at the top of the conference, along with the three teams at the bottom behaved and “fell into place” this week, but Dayton, together with Massachusetts and Rhode Island, continues to be outliers. The Flyers are used to that role, one they assumed virtually all of the 2010 conference season as well. The SOS will bounce around for the next few weeks, as less than 50% of the conference schedule is official to this point. 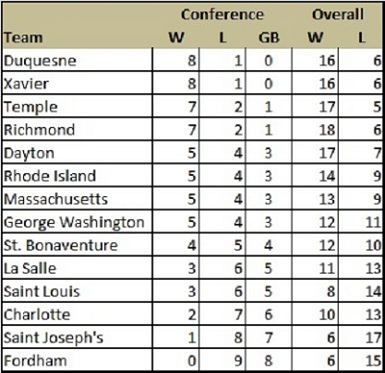 Duquesne‘s record is consistent with its efficiency differential, but their SOS suggests this may be due to an easier schedule. 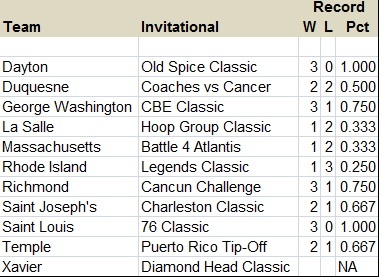 Games against Dayton, Temple and Richmond, however, suggest the record is legitimate and earned. As the Dukes play through February their record and SOS are elements worth monitoring. 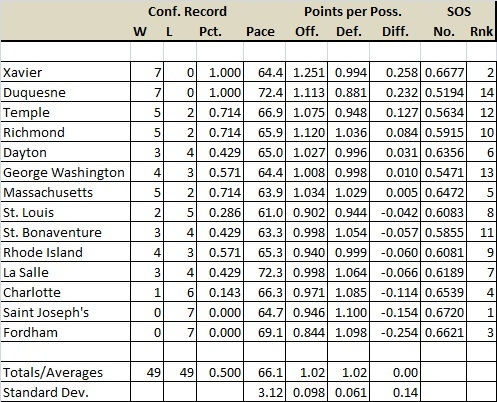 Massachusetts’ negative differential is a significant counterpoint to the Minutemen’s conference record. Their two conference losses were blowouts — by 29 to Xavier and by 16 to Richmond. UMass faces the second-best defense in conference (so far) in Saint Louis on Wednesday, and if the Bills can find a scorer somewhere on their roster, that game may be less certain a win for Massachusetts than it first appears. Though Fordham lost both games again last week, they nevertheless narrowed the differential gap that had opened at the start of conference play. The showdown games broke for the favored teams last week, leaving the top one-third of the conference standings virtually intact. St. Louis had a bad week, as did Charlotte, and both fell to the bottom third of the rankings. The Musketeers had another 2-0 week as Tu Holloway received his fifth Player of the Week citation (second in a row), from the conference. 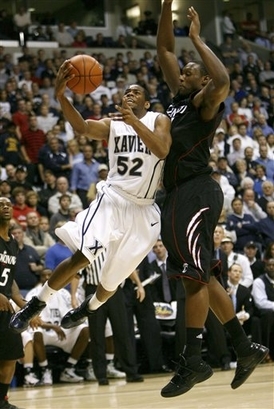 Holloway averaged 27.5 points, 7.0 rebounds and 4.5 assists in X’s wins over GWU and Richmond. Coach Chris Mack‘s squad will travel to Charlotte on Wednesday before hosting Saint Louis on Saturday. The Dukes closed out a “perfect” January with their fifth 2-0 week, running their winning streak to 10. Duquesne’s “May-November Couple” senior forward Damian Saunders and freshman point guard TJ McConnell were cited together for the third consecutive week. Saunders with an Honor Roll citation (his fourth this season), was cited for averaging a double-double (16.0 points 10.0 rebounds) in games against Fordham and Dayton. McConnell averaged 14.5 points, 7.0 assists and 5.0 rebounds and in the Dukes’ two games. Duquesne, touting the highest possession rate in conference games this season (72.4) won each game by double digits (19 points versus Fordham, 17 points versus Dayton). Duquesne plays at home this Wednesday against George Washington, then take to the road on Saturday to face St. Bonaventure in Olean, NY. The Spiders fell another game behind the pace last week, beating Dayton on the road (a bit surprising perhaps), but dropping a home game to co-leader Xavier. Richmond squandered a good opportunity to pull one of the conference leaders back to the pack, but also to post another resume win for Selection Sunday. Richmond is listed by ESPN’s Joe Lunardi in the “First Four Out” group as of last Monday (1/31). The squad should have an easier time this week as they face the conference’s two worst teams. No more slip-ups, guys. A Juan Fernandez-less Temple nevertheless posted 2-0 last week and pulled into a tie with Richmond for third place in the conference standings. Senior Lavoy Allen earned his third citation from the conference (a Player of the Week and two Honor Rolls) for posting back-to-back double-doubles in games with Charlotte and Saint Joseph’s. Fernandez, diagnosed with a bone bruise earlier this month, missed both games, in a prudent move by Coach Fran Dunphy. A wise move given the opponents, the Owls managed a nine point winning margin over the 49ers and an 18 point win over Saint Joseph’s. The back court quartet of Scootie Randall, Ramone Moore, Khalif Wyatt and TJ DiLeo combined for 42 points versus Charlotte and 39 versus Saint Joseph’s. Next week, the Owls travel across town for a game at La Salle, and host up-and-down Rhode Island on Saturday. Those two games, which Pomeroy projects as wins, should, worst case, have the Owls keep pace (albeit two games back) with Xavier and Duquesne, but coach Fran Dunphy knows that long term he has to get his back court leader healthy to stay in the conference race. The Minutemen had a 2-0, bounce back week, beating the Bonnies in an important road game, then most importantly, beating Rhode Island in a head-to-head for a piece of third place in the conference standings. Senior guard Anthony Gurley earned his fifth citation (second consecutive) for the Honor Roll as he shot 45.2% from the field while he averaged 24.5 points and 5.5 rebounds in UMass’ two games last week. The Minutemen will take to the road for their longest road trip of the conference season, traveling to Saint Louis for a game against the struggling Billikens and then over to Philadelphia for a game against with the also struggling Hawks of Saint Joseph’s on Saturday. Rhode Island beat a struggling Saint Louis team Wednesday, but dropped a ten-point game to Massachusetts Saturday. The 1-1 week translates into an ever-shrinking post season prospect (NIT anyone?). Senior forward Delroy James earned his eighth Honor Roll citation from the conference as he averaged 18.0 points, 7.0 rebounds and 4.0 assists for the Rams last week. A Wednesday game versus struggling Fordham followed by a trip to Philadelphia and Saturday game with a wounded Temple squad lies ahead this week for coach Jim Baron and company. The Runnin’ Rams should be fine versus Fordham, but a win at Temple is chance to stay within striking distance in the conference race. The Colonials logged a 1-1 week, stopping their losing steak at four when they beat Saint Louis on Saturday. They stay just north of 0.500 in conference play. Junior Tony Taylor‘s 20.0 point average for the two games earned him an Honor Roll mention, his fifth this season, by the conference. Karl Hobbs takes his team on the road for both games next week. They travel to Pittsburgh for a game with Duquesne on Wednesday. If the odds are long in Pittsburgh, they should be more favorable in Charlotte on Saturday. The Colonials will face the 49ers in a game they will need to win to stay above 0.500 in conference play. The Flyers logged their second 0-2 week this season; their first in conference play since last March. If that was “Statement Week” for Dayton, the pronouncement is “not happening”. Senior Chris Wright earned a mention, his sixth (to go with his citation for Player of the Week earlier this season), for the conference Honor Roll with his 15.5 point, 9.0 rebound average for those two games. The losing streak should stop at two as Brian Gregory‘s troops host St. Bonaventure on Wednesday and then travel to La Salle for a Saturday game. Maybe they will have another streak – of the winning nature — going into Week Six of conference play. Coach Mike Schmidt’s Bonnies broke their three-game slide Saturday at Fordham, but not before dropping a home game versus Massachusetts on Wednesday. Junior center Andrew Nicholson earned his seventh Honor Roll nod as he recorded his eighth double-double (25 points, 11 rebounds) of the season in the Fordham game. The Bonnies travel to Dayton for a Wednesday game with the Flyers, then return home to host Duquesne, on Saturday. A 1-1 week would be a morale boost for the squad. The Explorers ran off a 2-0 week, as Dr. John Giannini‘s benching of Aaric Murray appeared to continue to pay dividends. The results put La Salle in a three-way tie for eighth place in conference standings, four games behind conference leaders Duquesne and Xavier. Murray earned his seventh citation to the conference Honor Roll as he shot 63% and averaged a double-double (17.5 points, 11.5 rebounds) in the two games last week. February opens with something of a “Statement Week” for La Salle, as the Explorers host Big 5 rival Temple and faltering Dayton in back-to-back home games. Beating Dayton, a team that has struggled with their A-10 conference road slate, would have an effect on the battle for eighth place (and most likely seventh place as well). The “Sort Out Week” sorted the Billikens to the bottom third of the conference, as Saint Louis closed out January on an 0-2 note. As for relief, the cavalry is not coming, not in 2011 anyway. Head coach Rick Majerus nixed the idea of a 2011 comeback for Kwamain Mitchell, the two year point guard suspended just before the open of fall practice for an incident in the spring of 2010. Though Mitchell was readmitted to Saint Louis University and reinstated to the basketball program for the spring semester, Majerus has insisted that unless “…we ended up with four players and he’s the fifth. He’s not going to play. He’s not ready to play…” While there is virtually no chance Saint Louis can roll out another “Fabulous February” like 2010 (7-1), next week’s opponents, Massachusetts on Wednesday and at Xavier on Saturday, would be the place to begin. Stay tuned. Charlotte ran their current losing streak to four with losses to Temple and La Salle last week. Odds are good (if you follow Ken Pomeroy) that the 49ers will add one, possibly even two, to that streak next week. Guard KJ Sherrill earned his first Honor Roll citation Monday for his first career double-double (24 points, 13 rebounds) in the 49ers’ five point, two overtime loss to La Salle. That loss to La Salle opened a three-game homestand, and if Charlotte wants to solidify at least a first round game in the conference tournament, they should win another two or so conference games this season. George Washington is a reasonable candidate. After that, the pickings get very slim until the last week of conference play. Another 0-2 week for the Rams, as the percentages that they will finish the conference season without a win grew from an ominous 18% to an even more ominous 27.4% per Ken Pomeroy. Pomeroy employs a log5 formula to project winners and losers in each game, and offers the Rams’ 2/13 tilt with Saint Joseph’s, with a 33% chance of winning, as Fordham’s strongest opportunity to dodge a second winless conference season. After Saint Joseph’s, the best opportunity is Fordham’s home season closing game against Massachusetts (24%). News is not all bad however, as the Rams closed the differential gap between itself and the rest of the conference. Fordham travels to Kingston, Rhode Island, in a Battle of the Rams Wednesday, then back home to host Richmond on Saturday. The Hawks’ slide numbers eight consecutive games as of last week. Seven of the eight are lodged against their conference record. Freshman forward Ronald Roberts became the third member of the squad to earn an Honor Roll citation from the conference as he came off the bench to average 14.5 points and 4.0 rebounds in the Hawks’ two games. Perhaps it was the prospect of posting a second consecutive 20-loss season, or the realization that the Hawks had lost their eighth consecutive game to the Temple Owls. 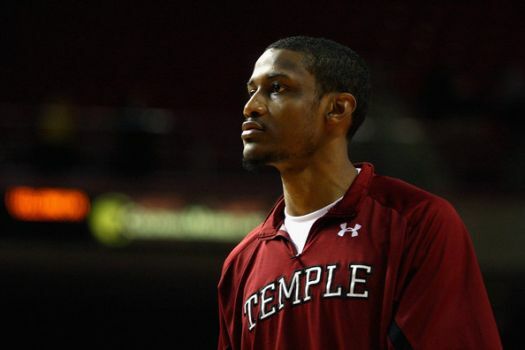 Or the Temple student rollout (Big 5 contests are notorious for their student rollouts) that read “It’s the Big 5, not the Big 5-15”, or maybe the realization that this would be his first last place finish in the Big 5 this decade. During the Temple post game press conference the Hawks’ coach of 16 years, Phil Martelli, initially attempted to draw a distinction between his squads’ play in 2010 and 2011 — “These aren’t beatings, these are losses, Last year, we were getting ‘beatings’. Now, we’re getting ‘losses’”, but he eventually snapped and lashed out at program critics who are “anonymous… (posters) from the netherworld. It’s not people who have been in the fray.”, pledging that “Vengeance will be sweet. And if my family gets hurt by it, then you are talking about a whole other ballgame”. Martelli, the most media-friendly and media-savvy member of the Big 5 coaching fraternity, has established a strong bond with both the Saint Joseph’s fan-base and the Phildelphia ink and radio media. His two “pillars” reacted in very different ways. Fans took to Hawks message boards Sunday and penned signed replies to the coach. The ink media tended to ignore Martelli’s statements completely in their game recaps, or soften his comments. The program suffered another blow when sophomore guard Justin Crosgile was granted a leave of absence from the team to attend to personal matters. The announcement did not indicate when or if Crosgile would rejoin the team. Crosgile had a promising freshman campaign, but his development stalled this season, and he was unable to get off the bench for a 5-16 team. Saint Joseph’s travels to Richmond for a Wednesday game, and returns to Philadelphia to host Massachusetts on Saturday. The week lacks the headliner games of last week, but there are a handful of games that should sort out the teams in the conference’s upper division. Dayton, La Salle and St. Bonaventure, sport identical 3-4 records, and Dayton will face both this week. The Flyers host St. Bonaventure Wednesday. 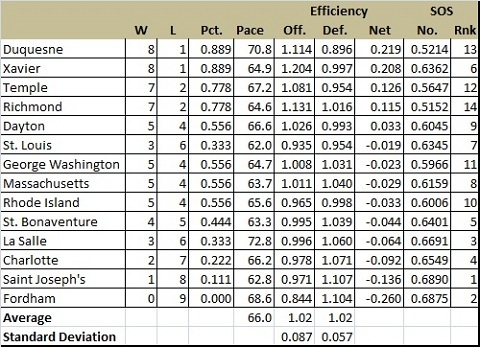 Dayton’s efficiency differential suggests they should have a better record than their 3-4 tally to date. 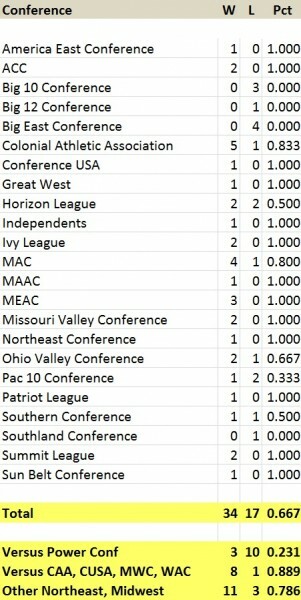 A Pythagorean Winning Percentage of 0.514 projects an 8-8 conference record. 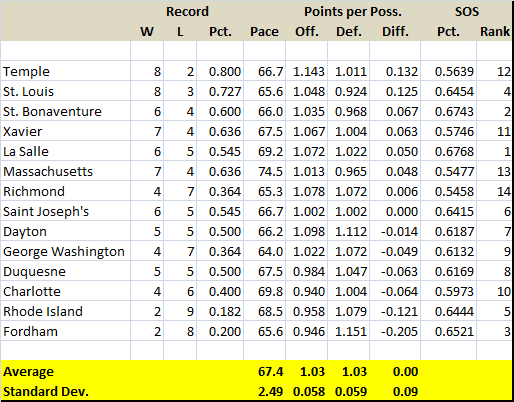 Bonaventure’s Pythagorean Winning Percentage projects (based on conference games only) a six win record, while La Salle’s projects to about five wins. Taking both games will not push Flyers back into the conference elites, but it will provide some definition for the middle tier of the conference. Rhode Island will most likely boast a 5-3 when the Ram visit Temple Saturday. The Owls play La Salle on Wednesday and should have either a 6-2 (likely) or 5-3 record to match Rhode Island’s. The loser falls another game off the pace, and trying to make up three games on the conference leaders with less than a month left in conference play is a pretty tall order.